"Pidgin is a multi platform IM client that allows you to instant message all of your friends and co-workers from one simple application." Pidgin is a multi platform client that allows you to instant message all of your friends and co-workers from one simple application. Pidgin is an open source instant messenger that has a developer following that ensures it's many features and stability. Formerly named Gaim, Pidgin has gone through many changes since it was originally made public back in 1998. Having been open source since it's creation, and having built a background has being one of the most reliable and versatile multi platform instant messenger available, Pidgin has made a name for itself on the Internet. Because it is open source; Pidgin, unlike other multi platform instant messengers, has many different customizations and add ons you can install from within the instant messenger that allows you to take control of how Pidgin functions for you. Having that kind of customization can only really come to you with open source software, and Pidgin's large community will ensure frequent updates to the application and it's add ons. Another thing that sets Pidgin aside is it being free. No ads, no catches; you get everything you need for free plus an array of add ons for personalization. 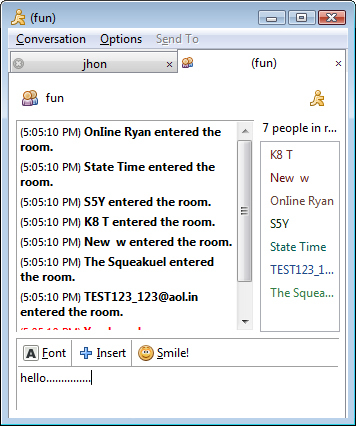 Pidgin connects to all the most common instant messaging software, including Windows Live Messenger, Skype, AOL Instant Messenger, and Yahoo Messenger. You can even connect with your friends on Facebook Messenger, which is something that, again, sets Pidgin aside from the rest. Having everything in one application makes your personal and business lives easier, and is definitely lighter on your PC. You can't really ask for more from an multi platform instant messaging client.